The Illinois Bicycle Lawyers of Keating Law Offices have been retained to represent a bicyclist who was injured in a bicycle crash in Savanna, Illinois. Savanna is located west of Rockford in northern Illinois. Moments before the collision, the motorist was driving westbound on Portland Avenue near the intersection of Viaduct Road. This bicycle crash occurred when the motorist was only looking to her left as she turned right. At the same time as the motorist was turning, the bicyclist was coming from the driver's right side and a collision occurred. As a result of the bicycle crash, the bicyclist was thrown from his bicycle, landing on the hood and windshield of the car. The bicyclist sustained injuries to his arm and shoulder that became so uncomfortable in the days following the bike accident that he had to visit a doctor. The bicyclist experienced limited use of his left arm for weeks and was unable to commute to work via his bicycle due to these injuries. 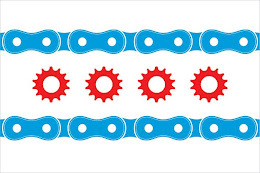 Due to its population density, most bicycle crashes in Illinois happen in Chicago. According to the Chicago Department of Transportation, approximately 55% of all Chicago bicycle crashes occur at intersections and 40% of all Chicago bicycle crashes occur as a result of a motorist's failure to yield. In this case, both of these factors were present and contributed to this accident in the much less dense area of Savanna, Illinois. This bicycle accident shows that regardless of the population density and location in Illinois, anytime there is a person operating a vehicle and not following the rules of the road a collision could result. It is of vital importance that all operators of vehicles, motorists and bicyclists alike, keep a watchful eye for bicyclists and pedestrians when they operate a motor vehicle. If you have any questions regarding this post or an issue involving Illinois personal injury law, please do not hesitate to contact Illinois Bicycle Lawyer Mike Keating at 312-239-6787 (Business Hours) or 312-208-7702 (24/7) or at MKeating@KeatingLegal.com. All emails and phone calls are returned promptly. Keating Law Offices offers free, no obligation consultations to injured bicyclists. There are never any attorneys' fees or expenses unless the firm is able to make a recovery on your behalf.